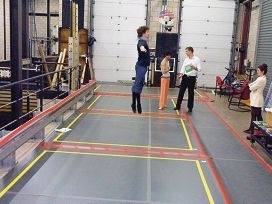 Dr Hopper used 3D motion analysis techniques to measure the movements of dancers during landings on a number of different floors. He said the inadequate flooring could increase stress to the feet and ankles of ballet dancers and increase the chance of injury and that hard floors increased the risk as opposed to those with a sprung support. ‘Dance floors are an integral part of the dance environment, yet little information is available for the dance community that concerns how dance floors may affect a dancer’s performance and possible injury,’ he said. ‘While I can’t say that flooring is directly responsible for causing injuries, it opens up discussion regarding flooring that is appropriate or inappropriate for dance.